Sometimes it’s a good idea to bring back old stories to refresh your memory. Some call it a myth, I say it’s the past, it’s now and the future. Like the title, a circle has no beginning and no end. What do you consider the biggest athletic competition? When you win your name stays throughout history. “Of course it would be the Olympic Games” and I agree with you. The Olympic games is not only 2776 years old.... or better, let me tell you the story as the good books tell it....And the good books are none other than the books you call Greek Mythology because 100 years ago (not to long ago) when people were talking about the Olympic games some of those very intelligent were saying it’s only mythology, that reminds me of people who told Galileo “that the earth doesn’t rotate around moon.” We will start with the kingdom of Elis. The first king of Elis was Aethlius, son of Zeus and Protogeniea, who was the daughter of Deucalion. Aethlius could not decide to which of his sons (Paeonas, Epeius and Aetolus) to leave the throne as all three were very capable. Since he did not want to show preference to one and displease the others, he had an idea. He would make them run and choose the winner as the heir to the throne. The three brothers agreed to the plan and decided to run in Olympia. That was the first athletic contest to take place in Olympia. Epeius was declared the winner and became king after the death of his father. Paeonas was very distressed that he had not been able to win the throne and left his home to settle far way beyond the river Axius. After the death of Epeius, who had no sons, his brother Aetolus came to the throne. However, he was not to reign for long, as one day, during a chariot race in which neighboring kings were taking part, he accidentally knocked down the King of Arcadia, Api, with his chariot. Api’s sons sent him to exile and so Aetolus gave up his throne. Several years passed. Dius was now king of Elis. One day, a stranger named Oxylus arrived in the land. He was the king of Aetolia who had been exiled for a year by his subjects as he had accidentally killed his brother, Thermius. He had killed him one day in the stadium while he was competing at discus throwing. He didn’t throw the discus in the right direction and Thermius, who was watching the competition, was hit on the head and died instantly. During this time the Dorians set foot in Peloponnesus. Oxylus, cunning as he was, did not take them through Elis because he was afraid that that if they saw how fertile and rich the land was, they would not give it to him. He led them to Laconia and Messenia, through the mountains of Arcadia. When he had finished with the Dorians, he returned to the capital of Elis and demanded Dius to hand over the throne. Dius realized that things looked bad and tried to find a solution. He proposed that they should each choose a warrior to fight a duel. If his warrior won, then Oxylus would give up his claim to the throne and return to Aetolia. If Oxylus’ warrior won, then Dius would give up the throne of Elis. He also proposed that each opponent should choose whatever weapon he wanted. Dius had a reason for proposing that last. He intended to choose one of his warriors who was famous for his abilities with a bow and arrow. His name was Degmenus and his arrows flew from taut string of his bow like lightning, always finding their mark. He would surely be able to kill Oxylus’ warrior easily. 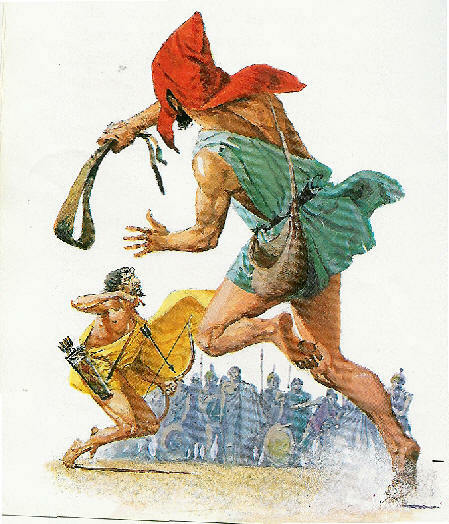 Oxylus decided to choose one of the few warriors with a sling, which was Pyrechmes. The two duelests walked away from each other, turned and stood facing each other, and before Degmenus had time to pull back his bow, the stone from Pyrechmes’s sling hit him on the forehead and he fell down dead. So Oxylus was declared the winner. The myth says that Oxylus was the founder of the Olympic games but, as we shall see further on, this is not certain. There are many candidates for this great honor. Perhaps Olympic Games were held even before Oxylus became king of Elis. Several years later one of his descendants, also King of Elis was Iphitus, he systematically organized the Olympic games which had not taken place for years. All over Greece great disaster had fallen due to civil wars and various epidemics. Iphitus in desperation, decided to visit the oracle of Delphi to find out what could be done to stop the evil. It is said that Pythia advised him to bring back the Olympic games, which had been forgotten. So, Iphitus brought back the Olympic Games. The first Olympic games during the time of Iphitus were held in the year 776 before the birth of Christ and they continued, every fourth year, almost without interruption, until the year 393 after the birth of Christ when Theodosius the Great abolished them.These are just a few of the myths surrounding the area of Elis, which, after Pissa was defeated was responsible for the organization and celebration of the Olympic Games..... In the summer 2008 the Olympic Games will be held in Beijing, China and in 2012 in London, England and the circle goes on.... I don’t know how I fit a whole book of Elis’ story on one page but I think I did a good job. If you want to know more about the history of the Olympic Games go to your neighborhood library. Merry Christmas, Happy New Year, Peace to All and God Bless Our Soldiers and Happy Holidays!